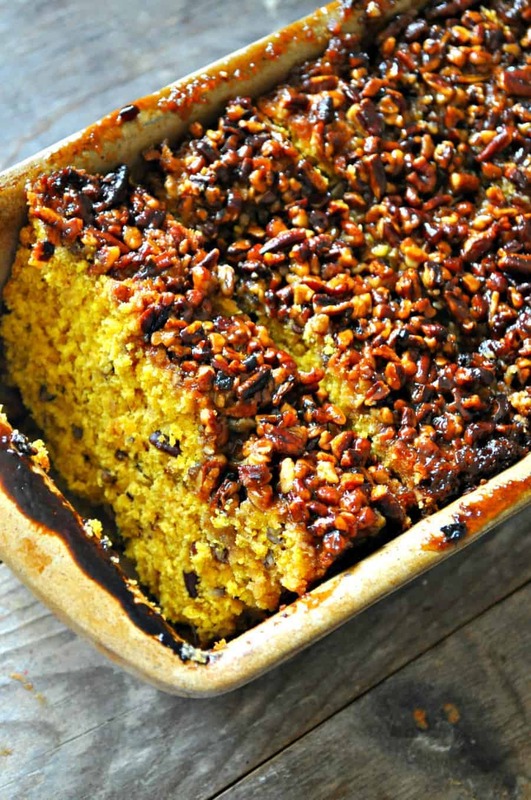 Refined sugar free, moist and amazing vegan pumpkin bread topped with a pecan pie filling type situation. 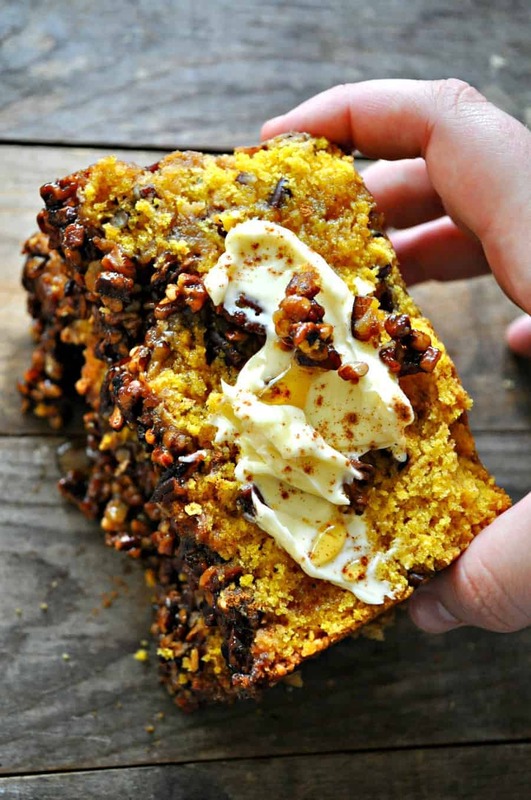 I can honestly say this vegan pumpkin pecan pie bread is one of the most amazing things you will eat this fall. 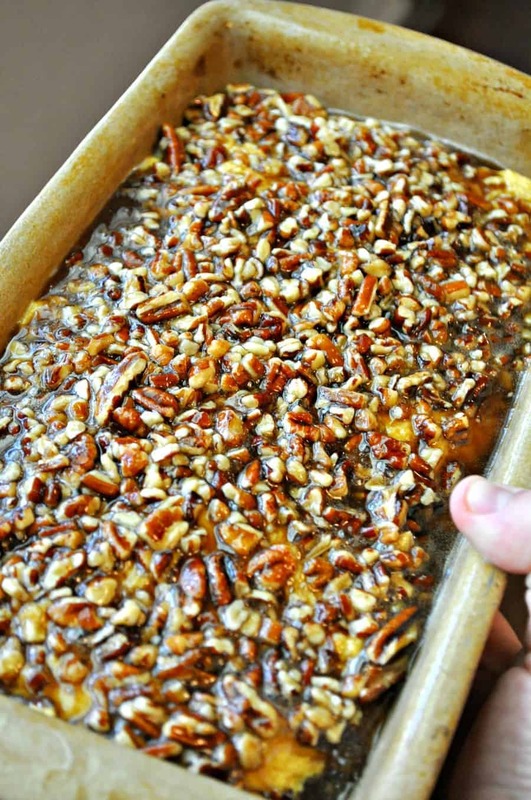 A quick and easy vegan pumpkin bread, sweetened with just maple syrup, studded with pecans and topped with melty, gooey pecan pie stuff. 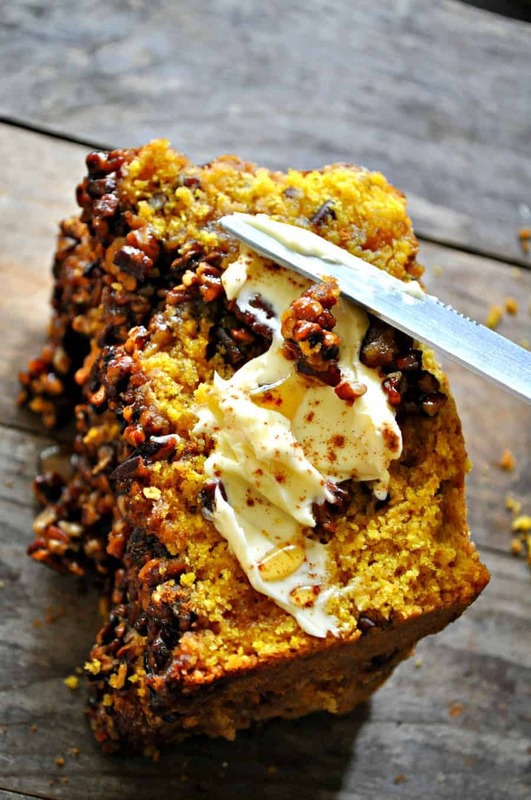 It is so dreamy, this vegan pumpkin bread doesn’t last in my house. Toast this bread for breakfast, and spread with vegan butter and a light drizzle of maple syrup and you will wonder how you lived with out this. 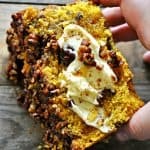 This vegan pumpkin pecan pie bread is also sweet enough for a dessert, but you can’t feel bad about indulging in this vegan, refined sugar free beauty! I think my favorite part about this bread is the pecan pie topping. You melt vegan butter, maple syrup and coconut sugar together with the pecans. Then pour this liquid gold onto the unbaked bread. Then, once it is baked, it forms a hard crispy pecan pie like crust on top of the bread. It is one of the most beautiful things in the world. Tis the season for pumpkin bread, and this, my friend, is the best. It has literally everything I want in a sweet breakfast or a dessert. Moist and pumpkiny on the inside, crunchy and pecan piey top. Sweet and a little salty. Oh, yeah! Vegan and refined sugar free pumpkin bread, studded with pecans and topped with a pecan pie filling type of situation. 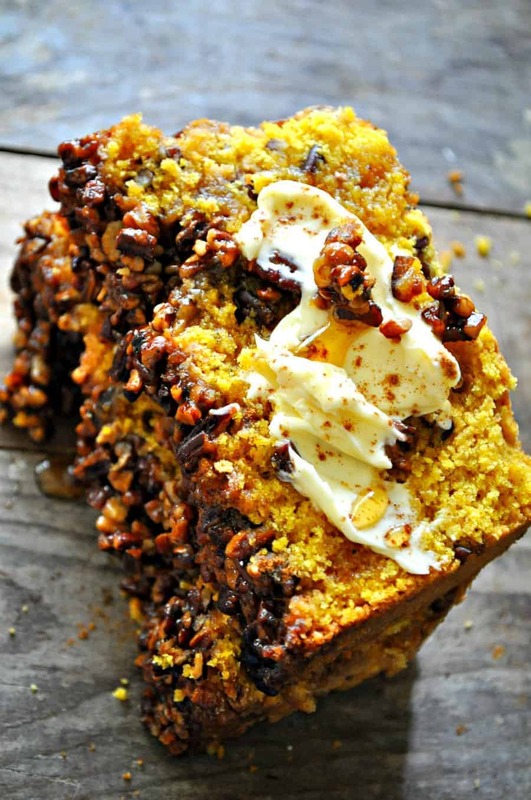 This is the best pumpkin bread EVER! Now with a hand mixer or a stand mixer, combine the room temperature vegan butter and maple syrup. Now bake at 350 degrees for 30-40 minutes or until a toothpick comes out clean. Let cool and serve immediately, or save for later, toast it and spread with vegan butter and a drizzle of maple syrup! This looks scrumptious! How does it freeze? This looks delicious! 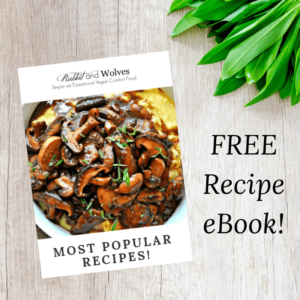 I’m navigating around trying to pick which recipes to try first as they all look so good! Do you have any absolute favorites? Very excited! I was also wondering.. A lot of your dishes ask for non-dairy milk, but should that be sweetened or unsweetened? I know on this particular one probably doesn’t matter, but for instance, the mashed potato bowls. Also, do you have any favorite particular cookware / bakeware / pans / etc? I need to get some reliable items. Thanks so much! Hi there, some of my absolute favorite savory meals are my garlic buffalo brussels sprouts and my lentil frisco melt! I love this bread and my apple pie bread as well! For this recipe, you are right, it won’t matter if you have sweetened non dairy milk, but I normally use unsweetened. I definitely recommend a cast iron skillet for so many things, if you don’t have one! I would love to make this for my Vegan daughter but she is also gluten free. Can I substitute the all purpose flour for any other gluten free flour? You can use gluten free all purpose with a little xanthan gum, or some people have told me they have used coconut flour! I have sprouted spelt flour, almond flour, coconut flour, and quinoa flour…I’ve read that all but the coconut can substitute at a 1:1 ratio. Is this correct? Do you have to use xanthan gum with these flours? I do believe that is correct. I do always recommend using xanthan gum in all gluten free baked goods. It really helps make the structure of your baked good resemble a baked good with regular all purpose flour. This turned out amazing!! Instead of vegan butter I used half coconut oil and half pumpkin puree. For the flour I did 1c all purpose and 1c white whole wheat. The kids gobbled it up!! 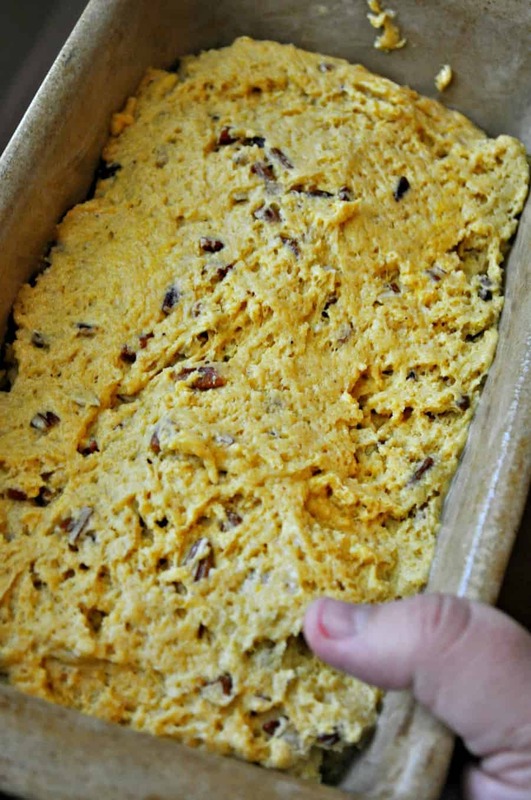 I’d love to make this, but my daughter is allergic to pecans! Could I substitute pumpkin seeds, or a different nut? She’s allergic to walnuts too, so that’s out! Absolutely! I bet pumpkin seeds would be amazing!